HIPPO Global Phase III schedule of daily activities. Note that this schedule is in Local Time to serve as a daily reference for GV crew. Actual flights are dated in UTC. HIPPO Global Phase 3 is over. Thank you everybody for your participation and making HIPPO-3 a success. Friday 4/16: RF11 from Anchorage to Jeffco. Power and access at 0800, take off at 1000, estimated duration 6 hours. GV science crew will meet at 0730 in the lobby of Tower 1 of Captain Cook for departure to the hangar. RAF crew will leave earlier to prepare the GV for the roll-out. There is a possibility of bad weather, so we might revert to an expedited preflight, in which case we will provide power and access at 0745 inside the hangar for instrument warm-up, rolling out at 0915 for a quick fuel-up and go. The flight will be at cruise altitude with one low approach at Watson Lake. The first half of the flight will be at or below the tropopause level (35-37,000 ft) and the second will be at cruise altitude (43,000 ft). Access (and power, if required) will be provided at Jeffco after landing, supported by the RAF Jeffco staff for about 2-2.5 hours as needed. Thursday 4/15: RF10 from Anchorage towards the N. Pole. Power and access at 0800, take off at 1000, estimated flight duration 8 hours. Expect 5 dips, returning to PANC at high altitude. The GV crew will meet at Captain Cook, Tower 1 lobby at 0740 to depart to the hangar; RAF staff will leave earlier. If the weather is inclement we will determine the ability to take off upon the arrival at the hangar, and if possible will revert to abbreviated preflight if the accumulation is small enough not to prevent GV flight. This will consist of power and access in the hangar from 0745 to 0915, then roll out, fueling and take off without additional warm-up time on the ramp. Fueling and minimum aircraft preflight will take about 30 min, during which uninterrupted power for instruments will be provided. Warm-up will have to be finished during the beginning of the flight. If the weather is not suitable for flight, we will delay the entire schedule one day and provide power and access for maintenance as necessary. Wednesday 4/14: Maintenance day in Anchorage. Power and access from 1000 to 1800 as needed. People servicing flasks and instruments will be at the GV in the morning. The Harvard team will arrive at the GV after the telecon (1200 AK time) to service the cryogens. Tuesday 4/13: RF09 from Kona to Anchorage. Power and access at 0800, take off at 1000, estimated flight duration 8.5 hours. Expect no dip at Cold Bay; total of 7 dips; extra loiter time over Alaska at high altitude. Monday 4/12: Maintenance day, power and access from 0800 to 1600. Expect power from the ground power cart; we will only fire up the APU if we need to cool down the cabin of the GV. With the weather in mid 70s we will hopefully be able to stay on GPU all day as necessary. Teleconference to plan RF09 takes place at 1000. People staying at King Kamehameha meet at 0730 after breakfast to carpool to the GV; the Harvard team will have an opportunity to come out later to work with the cryogens. Sunday 4/11: Hard down day. No power or access to the GV. Saturday 4/10: RF08 from Pago Pago to Kona. Expect 5 dips, flight duration 6.5 hours. Friday 4/9: Maintenance day in Pago Pago. Power and access in the morning as needed. Will discuss time for power and access upon arrival in Am. Samoa. Friday 4/9 NZ, Thursday 4/8 US: RF07 from Christchurch to Pago Pago. Power and access at 0800, take-off at 1000, estimated flight duration 6 hours. Thursday 4/8 NZ: Maintenance day. Power and access from 0800 to 1600 as needed. Wednesday 4/7 NZ: Maintenance day. Power and access from 0800 to 1600 as needed. Tuesday 4/6 NZ: RF06 to the S. Pole. Flight track is routed along 170E and five dips are expected. Power and access at 0800, take-off is at 1000. Estimated flight duration 7.5 hours. Lauder overflight on the return; forecast of the cloud cover over Lauder is favorable. Monday 4/5 NZ: Hard down day. No power or access to the aircraft. Sunday 4/4 NZ: Maintenance day. Power and access from 0900 to 1600 or 1700 if necessary. Friday 4/2 US, Saturday 4/3 NZ: RF05 from Pago Pago to Christchurch. GV crew is to meet in the lobby at 0730 for departure to the airplane. Power and access at 0800, tale-off at 1000. Estimated flight duration 6.5 hours. Lauder overflight looks questionable at this time due to the forecast of the cloud cover, unsuitable for ground measurements. Thursday 4/1: Maintenance day in Pago Pago from 1100 to 1600 as needed. Flask swap first, followed by cryogen filling by the QCLS team. 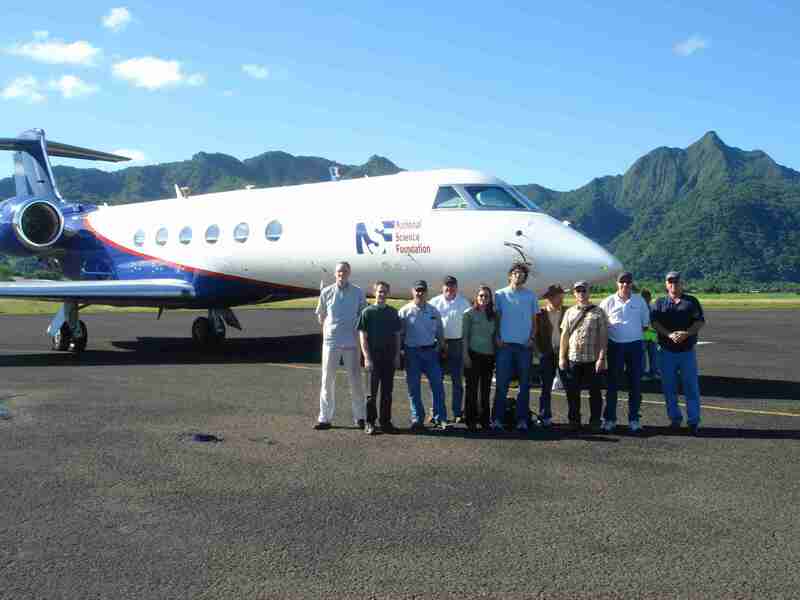 Wednesday 3/31: RF04 to Pago Pago, American Samoa. Power and access at 0800, take-off at 1000, estimated flight duration 6.5 hours. Tuesday 3/30: Maintenance day from 1100 to 1700, as needed. There will be a flight planning teleconference at 1000 HI time. After the teleconference Greg Bruning, John Cusack and flask system operators will depart for the GV, followed by the QCL crew with Pavel around 1300 to service the cryogens. Shipping needs to be taken care of as well on Tuesday. Monday 3/29: RF03 to Hawaii. There will be a low approach at Cold Bay. Likely number of dips is 8, including the missed approach. Near Hawaii the GV will deviate to the East to allow for a descending approach pattern circling the island from the North starting from the Hilo side. Approximate flight duration is 8.5 hours. Roll out is at 0730; power and access at 0800; take-off is at 1000. Sunday 3/28: Hard down day in Anchorage. No power or access to the aircraft. Note that there will be no teleconference; please make sure to visit the field catalog to get the forecast updates. Saturday 3/27: Maintenance day, power and access from 0800 to 1600. If we are finished early and nobody is around, we will power down and leave, so if you are leaving temporarily and plan to resume work later please let RAF staff know so that you don't come back and everyone is gone. Friday 3/26: RF02, N. Pole flight. Roll out at 0730, power and access at 0800, take-off at 1000. Estimated flight duration 8 hours. There will be a missed approach at Fairbanks and probably 5 more dips, starting with one over the coastline. The track will follow 149W. After reaching the halfway point the GV will climb to max altitude, then attempt to descend to FL290-320 near Fairbanks and follow the tropopause before landing in Anchorage. Thursday 3/25: Maintenance day. Power and access from 0800 to 1600; if we are finished early and nobody is around, we will power down and leave, so if you are leaving temporarily and plan to resume work later please let RAF staff know so that you don't come back and everyone is gone. Flight planning teleconference at 1200 AK time. Pavel will stop by the main entrance to Capt. Cook around 7:45 AM to see if people need a ride (I have a large van). John Cowan has the only access card we have, so please give Pavel or John a call to get into the hangar. There will be a teleconference at 1200 for flight planning for Friday and Monday flights. Let's meet in Pavel's room (306) at noon, or you can simply dial in from your own room or other location using instructions provided by Vidal. Wednesday 3/24: RF01, Jeffco to Anchorage. Power and access only if needed from 0730 until maintenance on the GV is finished. If you do need power and access, contact Brent in the morning. Keep in mind that during work on the engines the power may be turned off and on at any time with very short notice; this is why we do not encourage using instruments at that time. We expect to be finished with maintenance by 0930 and the aircraft will be immediately moved to the ramp for engine runs. If those are successful, a 2-hour preflight will immediately follow. Estimated take-off is at 1230 or earlier if we are able to begin preflight earlier. Flight plan: low approaches at Edmonton and Watson Lake, then direct to Anchorage. Estimated flight duration is 6.5 hours. GV crew - bring luggage and lunch, don't forget passports! Tuesday 3/23: RF01 cancelled due to a GV manitenance issue. Power and access all day as usual. Monday 3/22: RF01 cancelled due to a GV manitenance issue. Power and access all day as usual.